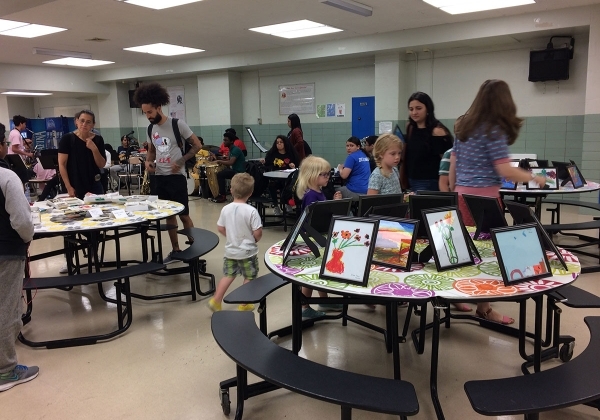 The Spring Arts Showcase brings students, families and community members together to celebrate the visual and performing arts at Washington Heights Expeditionary Learning School (WHEELS). This event is free and open to the public. Guests can buy food and student artwork while they enjoy watching student performances and browsing our student art gallery. This event’s purpose is threefold: to celebrate student work, to engage with our community, and to raise funds for the visual and performing arts. All of our students in grades Pre-K through 12 have the opportunity to perform or have their work displayed. The event lasts for three hours and guests are free to come and go, both in the auditorium, where music and movement performances take place, and in the cafeteria, where student artwork is displayed, students perform background music, and food is served. The target audience is our students, families, staff and community members, including donors and local officials. Last spring our state senator, Marisol Alcantara, attended our event. She has generously provided funding for the arts at WHEELS. We scheduled this event and reserved the school cafeteria and auditorium in January. Later in the winter and spring we met twice as an arts department, met several times with the Family Teacher Association, emailed the office of Senator Alcantara, and sent invitations to families in Spanish and English. We recruited teachers and family members to volunteer to supervise students, set up music and sound equipment, prepare and sell artwork, and donate and sell food. Did the volunteers receive anything in exchange for their time/service? They got to enjoy the event! 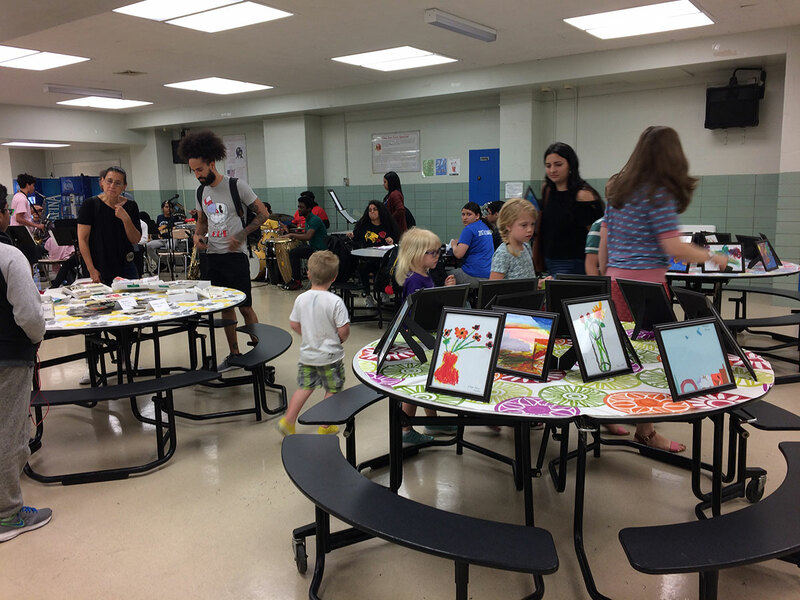 Volunteers supervised students, set up music and sound equipment, prepared and sold artwork, and donated and sold food. This was the first time we had a Spring Arts Showcase that included music, movement and visual art from grades Pre-K through 12. In the past the Spring Arts Showcase has included fewer grades. It was wonderful to bring our whole school and all of the arts disciplines together. About three hundred students performed or had their artwork displayed, we sold enough food and artwork to break even, and we had over three hundred guests attend our event. This project was more successful than in past years because we had more participants, and the quality of work improves every year. It’s important for events like this to have free admission and be open to the community. Families should be informed well in advance, in multiple languages if necessary (Spanish and English in the case of my school), and encouraged to attend. Invite local officials and other community members as well. Everyone should be able to participate and feel inspired by the students’ work, and they can donate if they choose to buy food or student artwork. It’s also important to create authentic opportunities for collaboration between arts disciplines.